The proverb of ''Evil that men do, do live with them'' played a vital role in Anambra elections yesterday. As it didn't occur to one of the candidates in the election that all his propaganda, fabricated stories and unjustified actions against the Land and Ndi Anambra will catch up with him on the D-day. 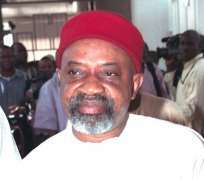 When Chris Ngige and his people were busy making some lousy noise against the incumbent government, when they betrayed the young and vibrant Idemili North candidate Ibezi Ifeanyichukwu of his candidacy, when they called our own people deported from Lagos 'destitutes', when they were carrying rumours against the gubernatorial candidate of APGA Willie Obiano of double registration, when they insulted and disrespected our land and traditions by insulting the Obi and people of Onitsha, when they 'cooked' and embarked on the mayhem of Uke stampede, when they could not sponsor a bill in the senate for 3 years, when they used the central senatorial allocations in building VIP toilets that doesn't have location, when they were spreading false and senseless accusation against Peter Obi for persecuting Anglicans, just to caught the unnecessary and irrelevant attentions of the Anglican faith, and when they feels that politics and public office holding is their birth right for contesting in 2003, 2007, 2010, 2011 and 2014. They didn't know that NEMESIS for their callous actions and regards against Ndi Anambra will catch up with them, but Ndi Anambra have shown him that no matter what he ''told'' Tinubu/Buhari/Akande party that he is popular and outstanding, that is either he lied or lying to them, or that his popularity have fade and failed. ''Ekene dili Ndi Anambra'' for proving the Igbo worth and maintaining our identity. Disclaimer: "The views/contents expressed in this article are the sole responsibility of Tonie Osegbo and do not necessarily reflect those of The Nigerian Voice. The Nigerian Voice will not be responsible or liable for any inaccurate or incorrect statements contained in this article."